Our 2017 Advent Calendar is here! Todd and I had very different upbringings. Todd’s family embraced sweets. Todd’s mother carries a purse full of treats and she’ll stuff one in your pocket if she thinks you look even slightly hungry. Todd’s father has an insatiable sweet tooth that cannot deny a brownie (or a cookie or an eclair or a slice of chocolate cake). And Todd? He inherited the sweet tooth genes from both sides. For his high school science project, he bought many tubs of chocolate chip cookie dough ice cream from different makers to see which dough yielded the best cookie. He extracted the dough from the ice cream, baked it off, and ran a questionably scientific cookie tasting comparison. Many years later, it probably shouldn’t surprise anyone that he started a chocolate factory. As his wife, I can attest that Todd just really, really, really loves chocolate like no one else I’ve ever met. Back in Missouri, my mother was a nurse and a goat farmer. We grew up on rice and vegetables. And I mean that literally — each and every day we had the exact same dinner like clockwork — brown rice and frozen vegetable mix — without deviation for all of my elementary school years. So when a family friend gave me an Advent calendar loaded with chocolate to count down the holidays, I slept with it like a teddy bear. A piece of chocolate each day? We weren’t religious but whatever occasion brought with it a daily sweet treat — big fan! Big, big fan! Separated by a thousand miles, Todd and I grew up. And as college freshmen, we met and later married. And at some point, we started making chocolate from cocoa beans in our apartment. And then this hobby chocolate project grew legs and we moved to San Francisco to see what would happen. And yet when each holiday passed, I found myself longing to try the Advent calendars I saw in the grocery stores but knowing that the calendar I enjoyed as a girl probably wouldn’t give me the same joy today. This even became one of our favorite discussion topics — what would be in our dream Advent calendar? And who would make it? And eventually, how would we organize an effort to design an Advent calendar that showcases a local talented chocolatier each day? Norah, our fearless product manager in 2015, heard those conversations and insisted on co-designing an Advent calendar with Yvonne Mouser, a talented local artist. And thus, the dream came true. Norah sought out chocolatiers across the Bay Area to make toffees, caramels, truffles, and all sorts of treats with our chocolate. And to her amazing credit, she made it happen. In the process, we also learned why this project makes no sense. Most Advent calendars are designed with long shelf lives in mind since they are made so many months before the holidays. But we just couldn’t do that. Our partner chocolatiers are quality-driven, shy away from preservatives, and intend their treats to be eaten fresh within a few weeks. So, we didn’t have the option to make and assemble Advent calendars in October, or even early November. Designing an Advent calendar with the best chocolatiers in San Francisco means that everything has to come together just before Thanksgiving so we can sell and ship calendars within 5-7 days. Anyone with any business inclination would say this is a horrible, terrible, no-good idea. The likelihood of a printing mistake, a collaborator dropping out, a batch of chocolate just not tempering the way it should, or a box of truffles getting accidentally smooshed… there’s just no time to recover from error. The project is seriously riddled with potential for failure and I can’t even imagine how Norah did it that first year. At the same time, the Advent calendar is so good. Once we saw that it was possible, we had to find a way to make it happen again. 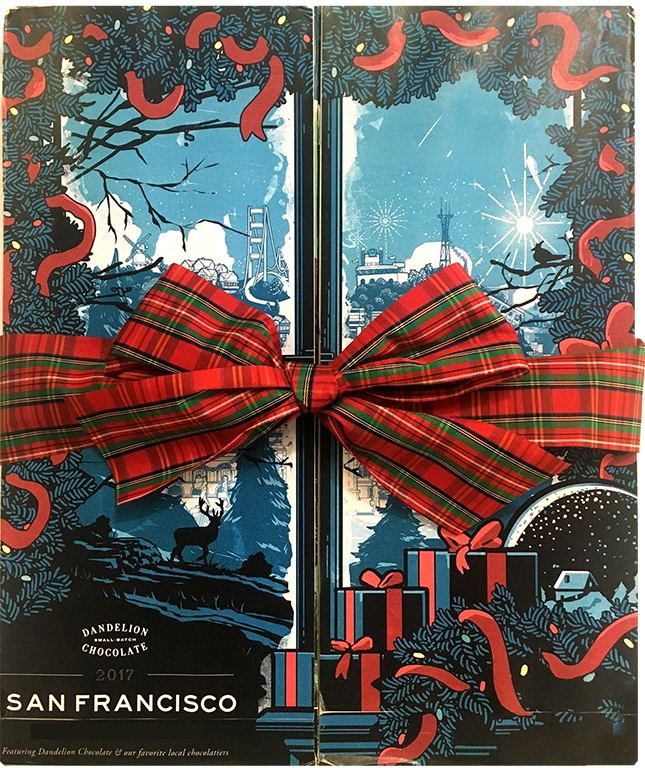 When life gives you a chocolate factory, it just seems like you should take the next logical step, which is obviously an annual San Francisco Advent calendar. This year’s calendar is our third. Norah has moved to new responsibilities and I’ve taken over this tradition in her stead. The project doesn’t live on any official product roadmap — everyone just assumes it will happen because we can’t imagine December without it. And this year, we stumbled upon the very talented Ronan Lynam. When he showed us his initial winter San Francisco scene, we were floored. And from there, Indica, our graphic designer, imagined watching this bustling nightscape from her window. 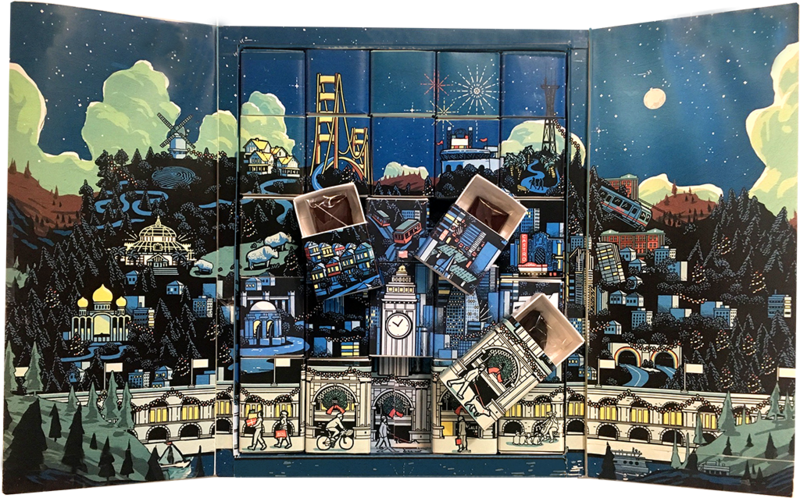 The flaps open to reveal twenty-five individual boxes with detailed iconic San Francisco landmarks. It’s our most elaborate Advent calendar yet. And the best part of the Advent calendar is what is inside. Our collaborators represent the small San Francisco chocolatiers who might not have a public storefront or a national presence. I don’t know of any other place where you can celebrate the very best of San Francisco’s chocolate all in one place. For them to take on this project during an already-busy holiday season is absurd & yet they rise to the challenge each year. I’ve included the full collaborator list below. If you haven’t heard of some of these small makers, please take a moment to visit their websites and learn more about these individuals who bring so much to our local food community. Given how many times I’ve opened and closed our various prototypes this year, you would think that this project might lose its charm by October. But no — opening this Advent calendar still gives me the tingles of joy that I recall having as a young girl. I can not wait until December 1st to open the first box! Though the holidays might seem far off, to a chocolate maker or chocolatier, December is just around the corner. If you’d like to see what we’ve all been working on this year, please head over to the Order page.